Pens are physical goods, while barbering is an intangible service. Physiocratic economists categorized production into productive labour and unproductive labour. Adam Smith expanded this thought by arguing that any economic activities directly related on material products (goods) were productive, and those activities which involved non-material production (services) were unproductive. This emphasis on material production was adapted by David Ricardo, Thomas Robert Malthus and John Stuart Mill, and influenced later Marxian economics. Other, mainly Italian, 18th century economists maintained that all desired goods and services were productive. The division of consumables into services is a simplification: these are not discrete categories. Most business theorists see a continuum with pure service at one endpoint and pure tangible commodity goods at the other. Most products fall between these two extremes. For example, a restaurant provides a physical good (prepared food), but also provides services in the form of ambience, the setting and clearing of the table, etc. Although some utilities, such as electricity and communications service providers, exclusively provide services, other utilities deliver physical goods, such as water utilities. For public sector contracting purposes, electricity supply is defined among goods rather than services in the European Union, whereas under United States federal procurement regulations it is treated as a service. Goods are normally structural and can be transferred in an instant while services are delivered over a period of time. Goods can be returned while a service once delivered cannot. Goods are not always tangible and may be virtual e.g. a book may be paper or electronic. Marketing theory makes use of the service-goods continuum as an important concept which 'enables marketers to see the relative goods/services composition of total products'. Distinctions are made between goods and services in the context of international trade liberalization. For example, the World Trade Organization's General Agreement on Tariffs and Trade (GATT) covers international trade in goods and the General Agreement on Trade in Services (GATS) covers the services sector. ^ Martin Shubik (23 June 2014). Proceedings of the Conference Accounting and Economics: In Honour of the 500th Anniversary of the Publication of Luca Pacioli's Summa de Arithmetica, Geometria, Proportioni et Propotionalita, Siena, 18-19 November 1992. Taylor & Francis. pp. 236–237. ISBN 978-1-135-60837-8. ^ "Difference Between Goods and Services: Visual Guide". Inevitable Steps. March 3, 2016. Retrieved March 3, 2016. ^ Mattsson, Katriina (2009). 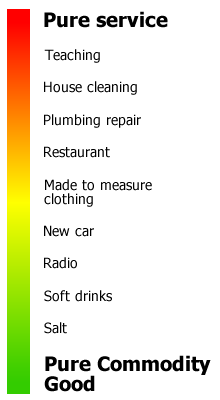 "Customer satisfaction in the retail market" (PDF). Theseus. pp. 15–16. Retrieved 18 November 2015. Hendrickson, C.T. ; Lave, L.B. ; Matthews, H.S. (2010). Environmental Life Cycle Assessment of Goods and Services: An Input-Output Approach. Taylor & Francis. ISBN 978-1-136-52549-0. 274 pages. Murley, L.; Wilson, A. (2011). The Distribution of Goods and Services. Dollars and sense: a guide to financial literacy. Rosen Central. ISBN 978-1-4488-4710-5. 64 pages.